Mrs. Dawlah Abdo Mohammed Al-Rafeaei, a 43 year old Yemeni citizen had 45 per cent burn injuries involving her hands some time back . She suffered 45 per cent burn injuries, eventually, she was treated at the local hospital in her country.She developed contractures of forearm and hand with severe deformities of fingers due to which she was completely dependent on the activities on others. She flew to Hyderabad to KIMS Hospitals for further management where she has successfully been treated and her burnt part have been brought to normalcy in a remarkably short span of time by the expert doctors. 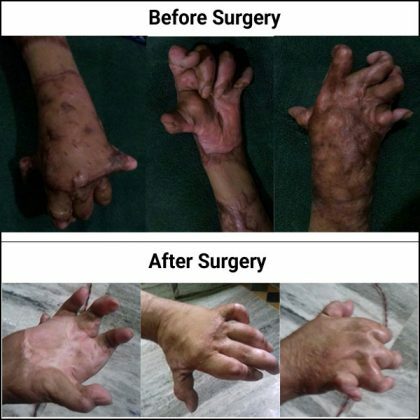 Dr Hemanth Kumar, noted plastic surgery consultant at KIMS, initially took over the case of Dawlah and performed surgeries on her hand for contracture release and deformity corrections. Later, she was shifted to Rehabilitation under care of Dr Ajay Midde and Dr Vedasri Dasoju for Pre & Postoperative rehabilitation care. She underwent standardized evidence-based physiotherapy protocol. She has been put on timely immobilization and mobilization phases. She was off the plaster for exercises, where she was put on Mobilization, Manipulation techniques, wax and 1 MHz ultrasound treatment for her soft tissue mobilization, which is followed by progressive strengthening and training of activities of daily living. The condition of patient’s hand was improved to moderate disability from severely disabled condition at the time of admission into the hospital. Dawlah’s son thanked the team of doctors at KIMS and applauded the facilities provided at hospital for the patient during the treatment. He especially thanked Dr Hemanth, Dr Ajay Midde and Dr Vedasri for their support in making it possible for his mother to live normally and for neurorehabilitation treatment.